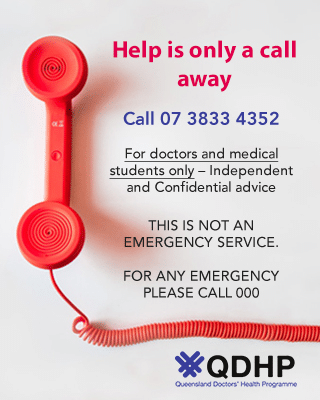 DHAS(Q) is an independent organisation and in June 2016 it established the Qld Doctors’ Health Programme to act as its service arm to enhance the services it provides to doctors and medical students. The DHAS(Q) is a not-for-profit charity association supported by volunteer practitioners and community members who work on the Management Committee. The members of the association are doctors and professionals with a keen interest in doctors’ health who provide their time, expertise and service at no cost to support the activities of the organisation. The service is supported by donations and contributions from participating organisations. We are particularly appreciative of the support from the Australian Medical Association (Queensland) through its Business Support Services team. Your support of the work of the DHAS(Q) is still greatly appreciated. Several decades ago, a group of doctors decided to develop an organised approach to assisting their colleagues in difficulty, this lead to the formation of the DHAS(Q) under the leadership of Prof Joan Lawrence. It became apparent to them that doctors often failed to access timely healthcare and treatment despite and sometimes because of working in the medical profession. Doctors frequently continued to work while unwell to their own personal disadvantage. They experienced shame, and significant difficulty taking the step to consult their colleagues. Their initiative led to the founding of the Doctors’ Health Advisory Service of Queensland in 1989. Since then, the DHAS(Q) has regularly relieved the distress of doctors suffering sickness, helplessness, disability and misfortune, while recognising the direct benefit to the community in providing this service. The DHAS(Q) has worked as a charitable organisation working collaboratively with the Medical Benevolent Association of Queensland. During these formative years the DHASQ worked to establish connections with other doctors’ health services that were emerging in other states and territories across Australia and New Zealand. This informal network was strengthened to become the Australasian Doctors’ Health Network in 2009. Since 1999, the doctors’ health services have been running a doctors’ health conference every two years. As well as providing a strong academic and educational programme for these conferences, many of those working in this field have been contributing to the understandings of physician health by presenting research papers and workshops at international conferences. In 2016, the DHAS(Q) was selected by the Doctors’ Health Services Pty Ltd to receive funding as part of the Medical Board of Australia’s vision to expand doctors’ health services across Australia. These funds were provided to the AMA(Federal) which established a wholly owned subsidiary company, Doctors’ Health Services Pty Ltd, (DrHS) to distribute the funds and ensure the doctors’ health activities were delivered at arms’ length from funder. In response, the DHASQ established its own wholly owned subsidiary company, the Qld Doctors Health Programme (QDHP) to deliver these services on its behalf. Dr Margaret Kay was appointed as the inaugural Medical Director of the QDHP to establish this service.